Does superbia belong in this group? Does bxhxmx7 belong in this group? ZombieDeath Loves CLOWNS! 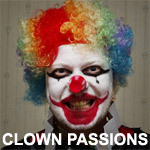 I love clowns a lot! Mostly evil ones. I also like to dress up as a clown and run around! Does zombiedeath belong in this group?